For the past few days, baby had been drooling and sucking her thumb. 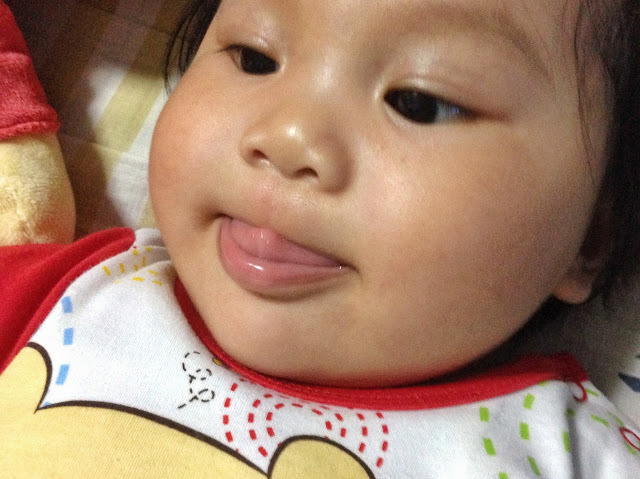 Today, she had started doing this tongue licking upwards action. I can't see anything. Then my mother (I was there for dinner) told me to feel her lower gum. I reached for the hanky after washing my hands to try to feel her gums. My mum told me not to use the hanky as I won't be able to feel anything with the hanky. True enough, I felt something sharp on her lower right gum. No wonder she keep moving her lips/mouth as if she's eating something. Back home, as she was latching to sleep, at a point, she kept biting me. It hurts. Alot. I wonder how other mummies survive teething latches.